Scotland’s Minister for Sport and the Lord Provost of Glasgow launched Scotland’s Commonwealth Walkway today by unveiling a special interpretive panel at The People’s Palace in Glasgow Green. Scotland’s Commonwealth Walkway is 20 miles/ 34km, connecting 34 key points of particular significance starting at City Chambers in George Square and including the Cathedral, Canal, Kelvin River, Botanical Gardens, Riverside Museum, House for an Art Lover, Pollok Park, Queens Park and the Games venues to the East of the City including Sir Chris Hoy Velodrome. The first marker of the first Commonwealth Walkway was installed outside Glasgow City Chambers in the presence of the then Commonwealth Secretary General, Kamalesh Sharma, GCVO, the day before the 2014 Games started. There are now 34 markers set into the footway outside each of the significant points. The panel gives an overview of the route and an introduction to some of the Walks key points of significance in a Commonwealth context. The panel location was been chosen by the City of Glasgow as outside the People’s Palace, where there is also a Commonwealth inspired fountain – the Doulton Fountain. A specially embroidered Commonwealth flag (hand stitched by the Trust’s Chairman!) 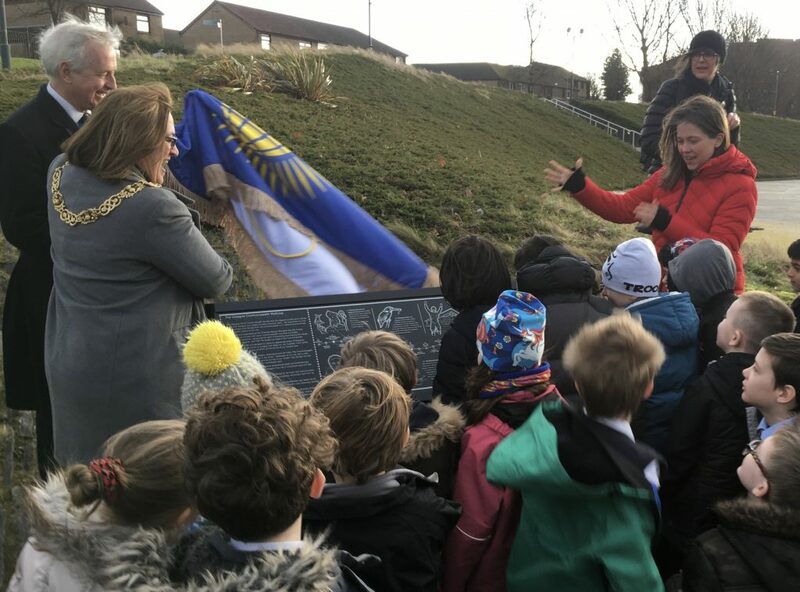 was placed over the panel for the unveiling – the same flag that was used by Baroness Scotland, Secretary General for the Commonwealth, at the unveiling of Canada’s Commonwealth Walkway in Banff in September 2017. Louise Martin, then Chair of Sport Scotland, on the Board of the 2014 Glasgow Games and now President of the Commonwealth Games Federation, was a key instigator of the Walkway initiative in Glasgow and has continued to be a great champion internationally. Louise said “The Commonwealth Games Federation were the first to agree, back in 2014, that every Commonwealth nation and territory should have a permanent route to help inspire an active and connected family of nations and im delighted that Scotland was the first to commit”. Aileen Campbell, Scotland’s Minister for Public Health and Sport, said “Building on the legacy of the hugely successful Commonwealth Games, we want to inspire more people to get active. That’s why I’m delighted that Scotland’s ‘Best Games Ever’ has inspired such a worthwhile international project – encouraging more of us to take a walk, not least as we continue towards Scotland becoming the first Daily Mile nation. Scotland’s Commonwealth Walkway has set a high standard for other nations and territories to aspire too and I’m pleased to hear that our friends in the Gold Coast will soon be launching Australia’s Commonwealth Walkway too, as part of the opening ceremony of the 2018 Commonwealth Games”.